March 3, 2012, I was blessed with the opportunity to make a difference. The village of Farabana is about 20 minutes from the main city of Bamako. Here the women and children endure a bare existence. It is hard to believe and see that this village exists just 20 minutes away from Bamako city and yet looking at the conditions you would think you are in rural Mali. In this village, most of the men are unemployed. The women, as is common in rural areas, do not work. Hence food becomes a big issue. The biggest impact of the lack of healthy food is on the women who are breastfeeding and the children. In Mali, as opposed to other countries, breastfeeding is encouraged, for health and cost-effective reasons, till a very late age until the child can walk and take care of itself. However, a lack of food, means that mothers cannot produce the milk that is healthy for their children. We went to Farabana to experience firsthand what these mothers and young children were going through and what we could do to help. As we walked through the entrance of the village, singing and drumming welcomed us. As we sat down, the woman performed multiple dances for us. They performed in their age groups, the young never dancing with the old. They sang songs of their village’s history. They told stories in their songs of what they want for their children. The most common dance is the circle dance, where woman as a community dance around in a circle. The circle is a symbol of unity and togetherness. One lady will usually lead the singing with the others chiming in a response. It was fun to see and experience that though the underlying culture may be the same, the way the women respond and perform different songs that are affected by their history and experiences. The Samake2012 interns were in attendance too and were only too happy to join in the dancing. I, as well, was called on to dance. I am a closet dancer. However, in fairness to other dancing videos I posted, I will post my own public dancing. I must say I had a fun time. After the dancing, several of the women leaders spoke. The head leader, Fanta Keita, spoke of the great things the women were doing to sustain themselves. She spoke of a shea butter project where women would make the shea butter and then sell it in the neighboring villages. Shea butter is an important ingredient in Malian life. It is used in cooking, but its biggest value is a medicinal value that Malians believe in. Additionally, the women would come in the afternoon to attend adult literacy programs. I was very impressed with these women. They were happy in spite of all their hardships. The thing that impressed me most was that they did not complain about what they did not have. Rather they were searching for opportunities to create solutions to their problems. They talked about clean running water and a mill as their primary needs that they were working towards. Next, we were invited to look at the different areas like where the women made their shea butter to where they studied. We walked over to where Sangay was supervising the preparation of the millet meal for the children. The children’s eyes were not only lit by the flame of the fire on the coal stove but also the eagerness for a meal. One little girl next to me took my hand, and as I asked her if she was hungry, she shyly nodded yes. They added milk, sugar, crushed peanuts and tamarind to the millet mixture. As the meal was close to being ready, the woman leader called for all the pots and pans in the village. I have never seen so many utensils organized so quickly. The eagerness was interesting but also painful to watch. I was so moved by the scene before me that I committed to the villagers that I would provide for them 2 months worth of food for their kids. Anything extra the women could sell to the neighboring villages to make some much-needed income. The women and children of Farabana taught me a lesson. They taught how sometimes it is the small gifts that matter because the impact is the greatest. 2 months food does not cost an immense amount of money. 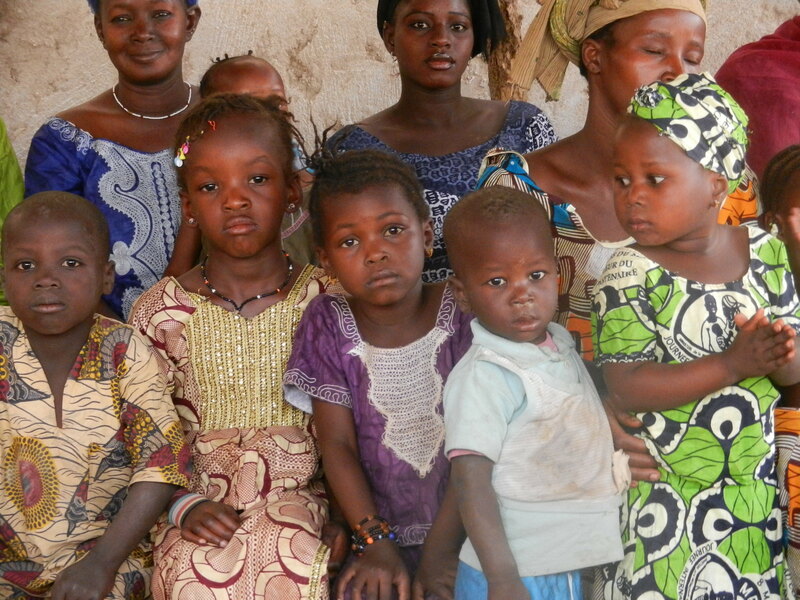 You could for $50/month bless the 50 children and their mothers with one solid meal a day. The blessing of a healthy, happy child is priceless. No one said it better than Buzz Aldrin: “If we can conquer space, we can conquer childhood hunger.” Join me and together let’s feed one village at a time. Email your support to marissa@samake2012.com. Are you in?